Last month, the anti-abortion group Life Always agreed to pull a billboard in New York that featured a child with the message, "The most dangerous place for an African American is in the womb," when the mother of the girl featured in the ad objected. So how is the group following up this fiasco? With an even more offensive billboard featuring President Obama! 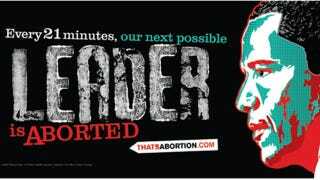 The new billboard, which features the message, "Every 21 minutes, our next possible leader is aborted," will be unveiled in Chicago tomorrow and be posted in 30 other locations, according to NBC Chicago. "Our future leaders are being aborted at an alarming rate ... These are babies who could grow to be the future Presidents of the United States, or the next Oprah Winfrey, Denzel Washington or Maya Angelou." So anti-abortion activists are clamoring for more liberal, pro-choice presidents? As we've discussed, the "black abortion is genocide" argument distorts the facts to make it appear that the abortion rate is higher among African-Americans because abortion providers are purposely targeting that community. The real issue is that African-Americans have a higher rate of unwanted pregnancies due to a lack of access to affordable healthcare. Planned Parenthood helps by providing inexpensive contraception and medical care, yet House Republicans ignored this when voting to defund it. It almost seems like anti-choice activists don't actually care about African-Americans — unless they happen to grow up to be Oprah or Denzel.